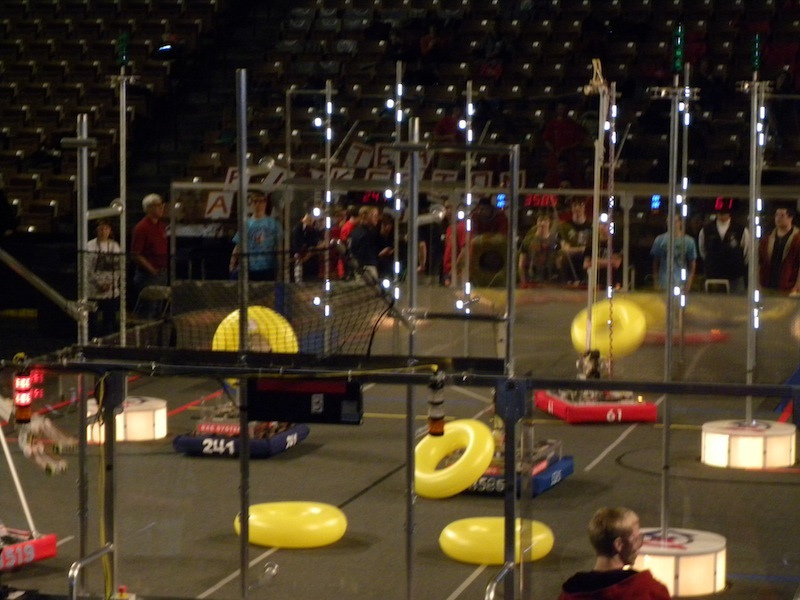 Welcome to the 2011 BAE Granite State Regional! Follow all the action here March 3rd-5th. March 5th 6:35 PM: Team 501 did not win any awards. Our record for the regional was 5 wins, 5 losses, and 0 ties. Hopefully, we’ll get autonomous mode working for Hartford. Please check our Photos and Videos page over the next week for more photos of the regional. Our next event is the Northeast Utilities FIRST Connecticut Regional. It will take place March 31st-April 2nd at the Connecticut Convention Center in Hartford, CT. We will be live blogging that event as well, so come back to powerknights.com and join us. On behalf of the entire team, thank you to everyone who followed along these last three days. See you in Hartford! Go Team 501! March 5th 3:23 PM: FINAL MATCH RESULT What an exciting match! There were plenty of tubes hung, but it came down to the minibots. For the first time in this regional, all four minibots went up. The blue alliance narrowly defeated the red alliance 84-77. Congratulations to Team 176, Team 175, and Team 1519. They will be eligible to go to St . Louis. Good job to all those who participated. Stay tuned for awards! 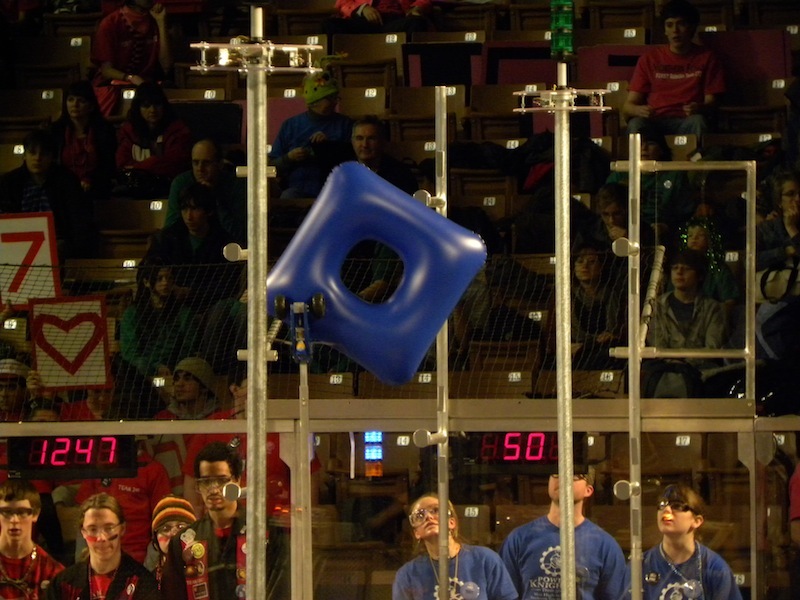 March 5th 3:11 PM: The blue alliance won the first match of the finals. If they win again, the red alliance is eliminated. Both the champion and second place alliance receive awards. The first place champion is also eligible to got to St. Louis for the national competition. A team has requested a 6 minute timeout. March 5th 2:52 PM: The second set of finalists has been chosen: Team 40, Team 131, and Team 20. Two of the finalist teams are local. Team 40: Trinity High School and Team 131: Central High School. Team 40 and 131’s websites can be found in our “Other FIRST Teams” area located to the right of this text. Finals will be starting after a 6 minute recharge break. March 5th 2:43 PM: We have one set of finalists chosen. March 5th 2:08 PM: Our robot is scheduled to go into the practice room at 2:20 to work on autonomous for Hartford. We are taking a break from blogging for a little while. The semifinals results will be posted when they are complete. March 5th 2:07 PM: The red alliance (#1 seed) just beat the blue alliance (#8 seed). The #8 seed is eliminated. The #1 seed moves on to the semifinals. March 5th 2:01 PM: The red alliance (#5 seed) lives on. They beat the blue alliance (#4 seed). March 5th 1:55 PM: The red alliance (#3 seed) just beat the blue alliance (#6 seed). The #6 seed is eliminated. March 5th 1:48 PM: The red alliance (#2 seed) just beat the blue alliance (#7 seed). The #7 seed is eliminated. March 5th 1:42 PM: The #2 seed and #7 seed are going again. If the red alliance wins (#2 seed), they will move on to the next round and #7 seed will be eliminated. March 5th 1:39 PM: The blue alliance (#8 seed) lives on. They beat the red alliance (#1 seed) 75-24. March 5th 1:34 PM: The #1 seed and #8 seed are going again. If the red alliance wins (#1 seed), they will move on to the next round and #8 seed will be eliminated. March 5th 1:31 PM: The red alliance (#4 seed) just lost to the blue alliance (#5 seed) in the fourth quarterfinal match 72-22. March 5th 1:25 PM: The red alliance (#3 seed) just beat the blue alliance (#6 seed) in the third quarterfinal match 100-18. 100 points ties the weekend’s high score for one alliance in one match. March 5th: 1:23 PM: The red alliance (#2 seed) just beat the blue alliance (#7 seed) in the second quarterfinal match 57-45. March 5th 1:17 PM: The red alliance (#1 seed) just beat the blue alliance (#8 seed) in the first quarterfinal match 90-50. March 5th 12:17 PM: We were not picked for an alliance. Therefore, our robot is through competing in the regional. We will continue to live blog through the rest of the day. 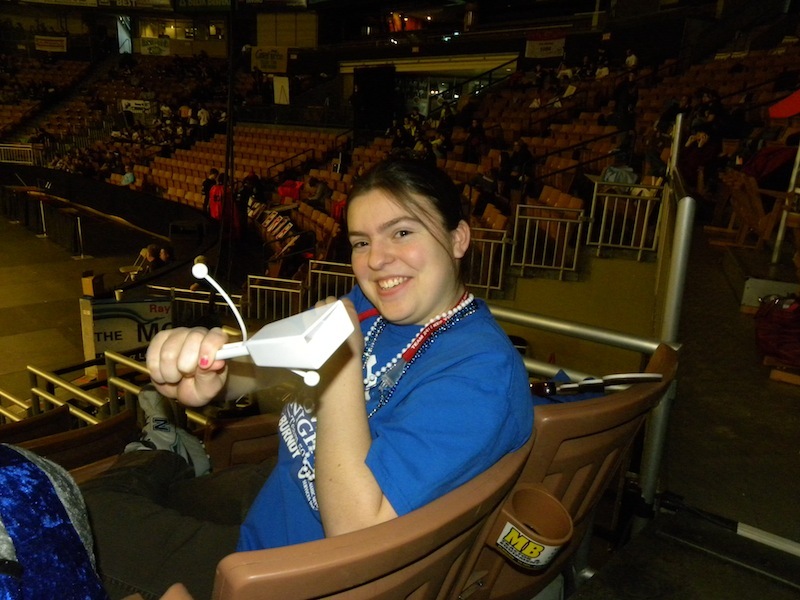 March 5th 11:51 AM: Match 87 Results Blue Alliance Wins 74-7. Our robot dropped another tube and unfortunately our alliance was never in this match. The opposing alliance hung two ubertubes, giving them 12 points from the beginning. 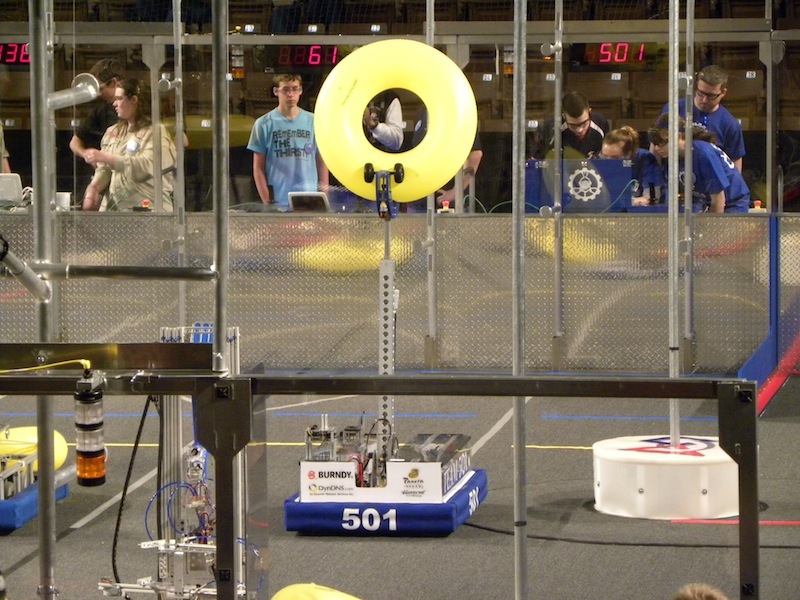 After that, two blue alliance minibots were deployed, giving them 50 more points.Our record is 5-5. Alliance selections for elimination matches are next. Stay tuned! March 5th 11:41 AM: Match 87 is next. We are on the red alliance. Stay tuned for results. Meanwhile, Match 86, which is going on now, broke the combined regional high score. March 5th 10:54 AM: We just had a very exciting match here. There was a three way minibot race and plenty of logos created. It ended up being a one point match. The crowd was electric! March 5th 10:21 AM: Match 87 is expected to be our last qualification match. Yesterday, members of our team and our robot were featured on a local TV station. You can watch the video online by clicking here. March 5th 10:15 AM: Our next match is Match 87. Meanwhile, other robots are really engaging is great minibot races. In addition, several alliances are working very well together. March 5th 10;03 AM: Match 70 Results Blue Alliance Wins 62-24. While trying to hang a tube, we popped it and it was stuck to our robot. Our alliance was winning up until the blue alliance deployed a minibot to win. We were later penalized for several infractions. Our record is 5-4. Stay tuned. March 5th 9:58 AM: Match 70 is next. We are on the red alliance. March 5th 9:52 AM: Match 66 Results Red Alliance Wins 32-6. Autonomous mode began to work. Our robot hung a tube, but we also dropped two tubes. We were winning until the red alliance deployed a minibot just before the buzzer. That gave the red alliance a 30 point bonus and a victory. Our record is now 5-3. Stay tuned! March 4th 8:18 PM: We didn’t win any awards today. Don’t worry! There is another awards ceremony tomorrow. 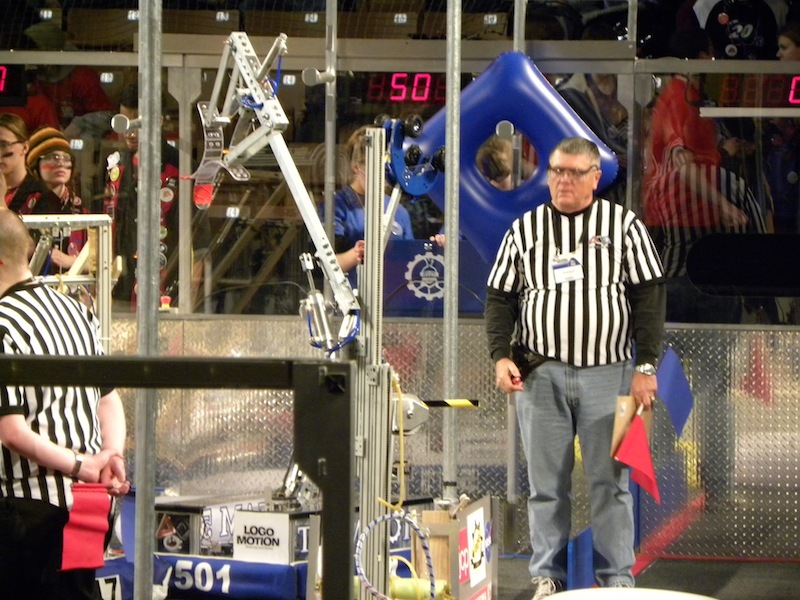 The robot performed well overall, winning 5 straight matches. Hopefully we can continue that success tomorrow. See you all then. Go Team 501! March 4th 6:48 PM: Replayed Match 10 Results Blue Alliance Wins! 42-35. We had a strong alliance again and our robot was able to hang a tube. With the help of an alliance minibot reaching the pole first, we won and negated our earlier Match 10 loss. This puts our record at 5-2 which is pretty good especially since the day started so bad. We are 15th out of 52 robots! There will be an awards ceremony next. Stay tuned! March 4th 6:25 PM: Match 10 will be replayed next. We will be on the blue alliance. Stay tuned for match results. March 4th 6:10 PM: They are stopping at Match 65 for today. They will continue tomorrow. However, they are replaying four matches from earlier that didn’t work right. One of the repeated matches is Match 10 in which we participated earlier. Stay tuned for that. Match 66, our last and final match, will take place tomorrow. March 4th 5:34 PM: Match 56 Results Red Alliance Wins! 45-36. Our alliance hung an ubertube and our robot helped complete a logo! Our alliance survived a minibot from the blue alliance and won. We are currently ranked 17th out of 52 teams. We also have our first winning record of the day at 4-3. Our next and final match is Match 66. March 4th 5:05 PM: We’ve been bumped back to Match 56. We will be on the red alliance. Stay tuned for results. March 4th 4:40 PM: Match 50 Results Blue Alliance Wins! 29-4. Our robot was able to pick up tubes, but they kept falling out of our arm. 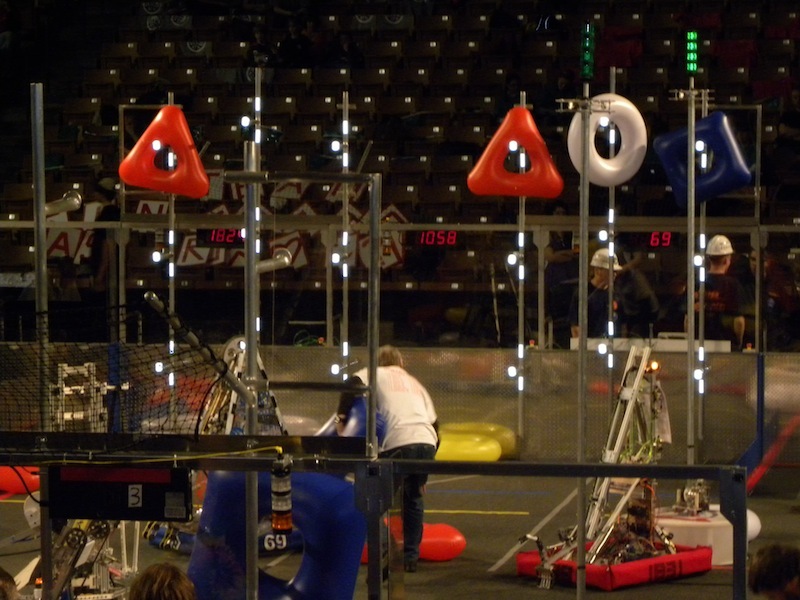 In addition, the our scoring rack was crowded with our alliance’s robots. Nevertheless, our alliance won thanks in part to ubertube bonuses. Our record is now 3-3. Our next match is Match 55. March 4th 4:25 PM: Match 50 is next. We are on the blue alliance. Stay tuned for match results. March 4th 3:13 PM: Match 36 Results Blue Alliance Wins 54-36! For the first time ever we competed effectively. We were able to take a tube from the feeding station, drive the field’s length, and hang the tube. We then picked up another tube from the floor and hung it. With our alliance’s help we created a logo that covered an ubertube, earning double points. Finally, a member of our alliance deployed a successful minibot. Fantastic match for the blue alliance and Team 501! Our next match is Match 50. Our record is 2-3. March 4th 2:20 PM: Match 27 Results Blue Alliance Wins 15-6 Our robot has switched to playing defense rather than offense. We were losing until one of our alliance partners deployed a minibot. It looked like we had won, but sadly one of our alliance members was penalized and the minibot tower was deactivated, negating the 30 points. Our next match is Match 36. March 4th 2:03 PM: Match 27 is next. We are on the red alliance. Results to follow. Match 4th 1:24 PM: Match 20 Results Red Alliance Wins 50-42! After obtaining a tube, our robot mysteriously became disabled. Luckily, the rest of our alliance was able to win by using a minibot and creating logos! We are now 1-2. We play again in Match 27. March 4th 1:18 PM: Match 20 is next. We are on the red alliance. March 4th 12:57 PM: Funny Photo of Dean, Woody, and the Director of NASA. March 4th 12:31 PM: The regional has resumed and it is currently in Match 13. We don’t play again until Match 20. They have announced that there were problems with the field from the beginning. Therefore, they are going to replay four matches at the end of the day. They will announce which match numbers will be replayed later on today. March 4th 11:32 AM: There are problems with field, so we are stalling by having mascot dancing contests and “Dancing With The Refs!” They are changing the schedule. Match 12 will not start until 12:30PM. March 4th 11:17 AM: Photos of the robot after hanging a tube. Match 4th 10:59 AM: Match 10 Results Red Alliance Wins 36-0. Ouch! We hung a tube and we were the only team on our alliance to do so. It was worth 2 points. However, our alliance suffered 15 penalty points negating our tube. The good news is that we hung a tube and nothing broke on the robot. We don’t play again until Match 20. Hopefully we can use the time to figure out autonomous mode, which has yet to work. March 4th 10:47 AM: The arm is fixed and Match 10 is next. We are on the blue alliance. Stay tuned for match results. March 4th 10:26 AM: Match 6 results Red Alliance Wins 36-0. We tried to feed a tube into the arm using the feeding station. Unfortunately, we hit the glass too hard and the end of the arm was dislodged. We hope it is a minor problem, so we can be up and running by our next match, Match 10. March 4th 10:10 AM: Match 6 is next. It is our first match and we are on the blue alliance. Stay tuned for results. March 4th 9:41 AM: Welcome to the first day of competition! Our match schedule is as follows: Match 6, Match 10, Match 20, Match 27, Match 36, Match 50, Match 55, and Match 66. We will report each match result as soon as the match ends. The date and time will be colored red or blue depending on which alliance we are on for that match. March 3rd: Photos from Thursday’s practice matches. March 3rd 5:40 PM The robot made it to the field and didn’t move. It was configured wrong so it couldn’t connect to the field. We’ll get here early tomorrow and work on it then. See you Friday! Go Team 501! March 3rd 4:38 PM We passed inspection and were are heading to field for the last practice match. Stay tuned for how the match goes for Team 501! Go Team 501! March 3rd 4:04 PM: Still working on issues. Stay tuned! March 3rd 3:35 PM: Our team has fixed the arm and we are working on a few minor kinks. We still have a few tests to run. Our driver believes that we should be able to pick up tubes soon. However, the status of the minibot remains questionable. March 3rd 2:40 PM Teams are getting better at autonomous mode and we just saw a fantastic minibot climb the pole. Teams are also effortlessly creating the FIRST logo on the scoring pegs. Unfortunately, our team discovered a problem with our arm that has delayed us further. We are actively working on fixing the problem. Stay tuned! March 3rd 1:39 PM A team just successfully deployed a minibot that successfully climb the pole. Awesome! March 3rd 1: 19 PM We are beginning to see some very strong teams. 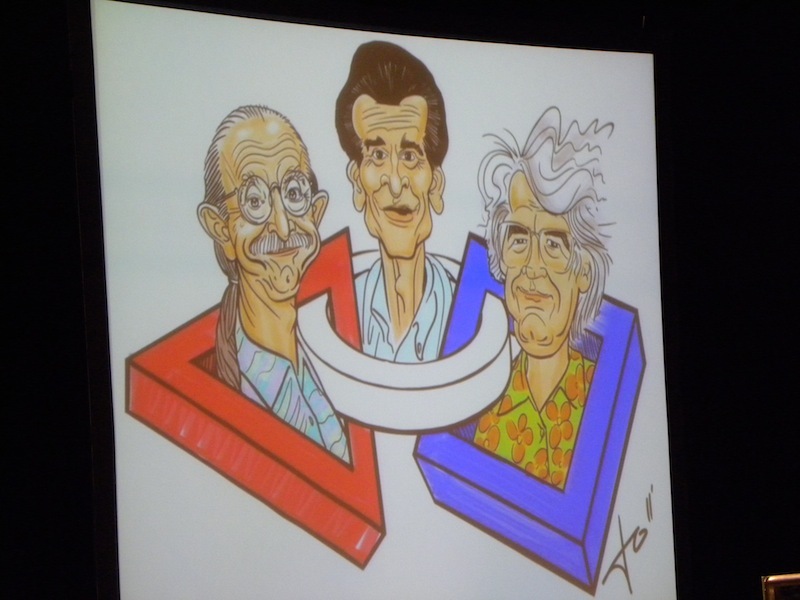 Many have constructed the FIRST logo effectively. One team has successfully placed an ubertube. A team has attached the minibot to the pole, but no one has climbed it successfully. We are still working on our robot and expect to have it on the field within the next hour. March 3rd 11:12 AM: We are in match 8 and our robot has yet to make an appearance. We are having issues and we are trying to resolve them in the pits. Our team members are having fun in the the stands. We’ll post some photos shortly.